The text focuses upon life stories of childless elders from Macedonia. Field materials include interviews with childless married couples from different villagesthroughout Macedonia, conducted during the last 15 years. Their stories provide the basic empirical data that enable following the changes of traditional values and norms related to old parents or relatives. Special attention is dedicated to the paradoxical (and often ironic) position of these people, who, due the general tendency of abandoning old parents by their children, end up equally lonely and vulnerable as those parents who have children.Although big families are not a guarantee for dignified old age any more, it is exactly these so called ‘traditional values’ that were promoted by the Government of the Republic of Macedonia in the period 2006-2017, though public campaigns that presented big families as a value that should be sustained and cherished. This article analyses the gap between the realistic state of affairs of the elderly, and the constructed, idealized notion of a secure and happy old age that combines economic, political, as well as emotional aspects. Jakimovska, Ilina, and Ana Ashtalkovska Gajtanoska. 2018. “OLD AGE-UGLY AGE: ETHNOGRAPHIC NOTES ON THE CHILDLESS ELDERS FROM THE REPUBLIC OF MACEDONIA”. 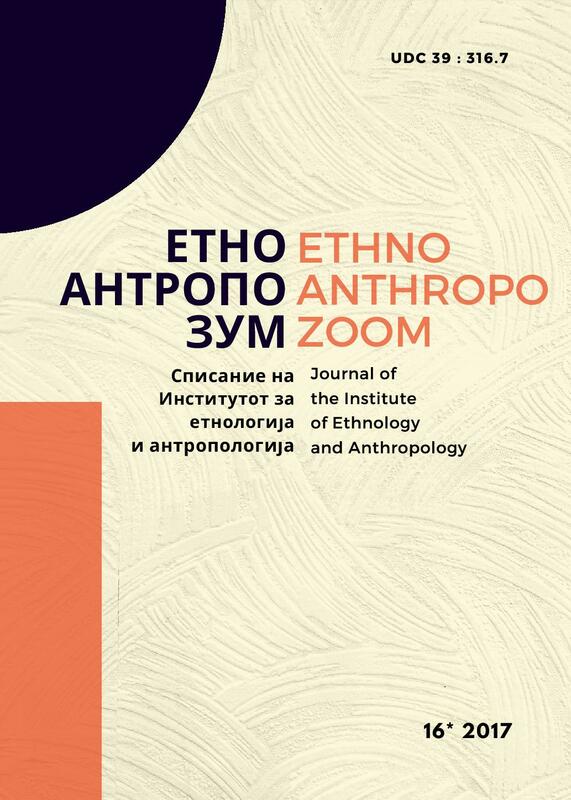 EthnoAnthropoZoom/ЕтноАнтропоЗум 16 (16), 131-47. http://etno.pmf.ukim.mk/index.php/eaz/article/view/401. Skok, Petar. 1971. Etimološki rječnik hrvatskoga ili srpskoga jezika. Zagreb. Јакимовска, Илина. 2009. Телото. Етнолошко – антрополошка студија. Скопје: Слово. Маринов, Димитър. 1995. Българско обичайно право, второ фототипно издание. София: Академично издателство „Марин Дринов“. Мирчевска, Мирјана. 2003. „Селата во Горна Река како општествено-економски заедници“, ЕтноАнтропоЗум 3: 136-163. Скопје: ИЕА. Павловиħ Јеремија. 1928. Малешево и Малешевци. Београд. радова у Кичевији“, Гласник етнографског музеја у Београду, књ. XIX, том XIX. Београд. Филиповиħ, Миленко. 1939. „Обичаји и веровања у Скопској котлини“, Српски етнографски зборник, књ. LIV, том I. Београд: Етнографски институт. Црвенковска – Ристевска, Инес. 2002. „Старечки домаќинства во Поречките села: современа состојба“, одбранета на Заводот по етнологија при ПМФ Скопје.